Firstly, please accept my apologies for the late response to your question regarding the arrangements around the Oval cricket road closures and one-way workings. This is something we will look at next year, as it is now too late to amend the Temporary Traffic Order. I have spoken to the Lambeth Cycling Officer, and in his opinion it would be simpler to tell cyclists to dismount for the short section of Kennington Oval for which the one way working is in operation. The diversion would be too long otherwise as it would entail using Clayton Street, Kennington Road, Kennington Park Road, Harleyford Street and then into Kennington Oval (the Red Route section) to rejoin LCN 3. I appreciate that this is inconvenient, and as a cyclist myself I would find this irritating, and we will promise to look at this next year, although we will have to consult with the Police as a major part of the reason for the restrictions are safety related and allow the Police to monitor all traffic, including cyclists. Housing, Regeneration and Environment Dept. I've emailed the Council to ask them why the police turned down their request for cycling to be allowed this year. I'm willing to bet that most cyclists ignore the signs and the police ignore the transgressors. And somebody will be whinging about cyclists going the wrong way down one-way streets. It was a gloriously sunny day to cycle through Lambeth enjoying Archbishops Park, Clapham Common, Tooting Common, Brockwell Park, Myatts Field Park, Kennington Park and the South Bank. 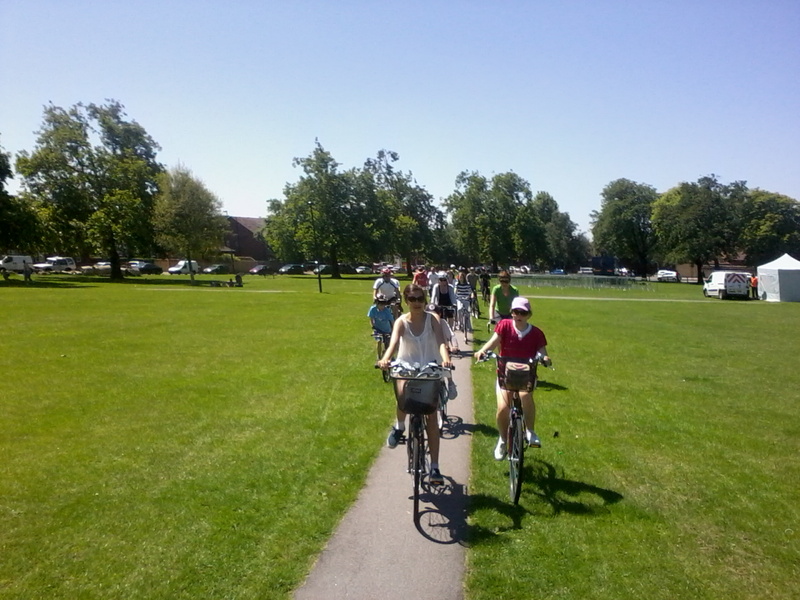 While more than the first year, numbers participating in Bike the Borough aren't yet huge - the maximum in our group was about 20 at any time, so I'd reckon maybe two or three hundred people did all or part of the route. As I whizzed along with the buses towards Lambeth Bridge this morning I passed this car with an appropriate number plate sitting in the one-person-per-vehicle jam. 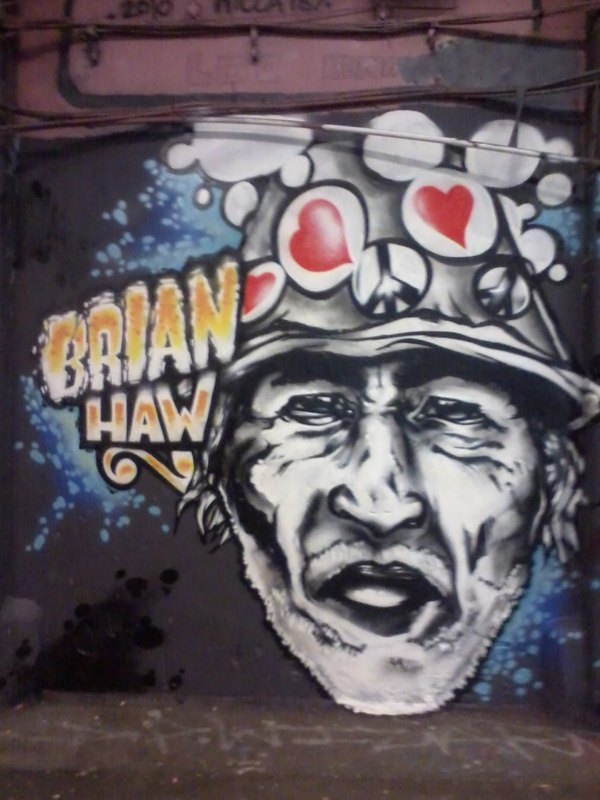 This afternoon, taking some pupils through Leake Street, we stumbled upon this ephemeral tribute to Brian Haw, the peace campaigner who spent the past decade in Parliament Square, t'other side of Westminster Bridge. 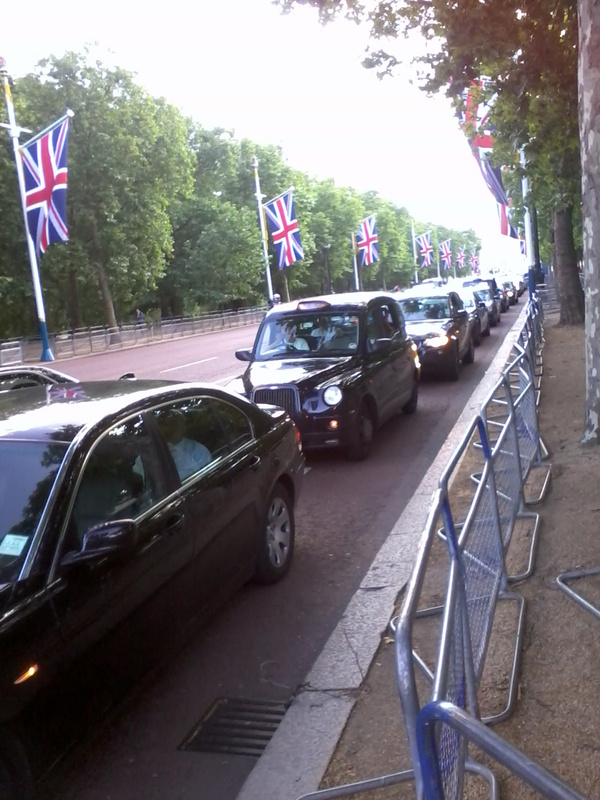 The 'War on the Motorists' blogspot believes he also merits out thanks for making Parliament Square a place again. Take a moment to read their post . I couldn't resist taking a quick snap of the Jubilee Greenway in Lambeth this afternoon, and by coincidence this very evening Crap Cycling and Walking in Waltham Forest posted, in a downbeat kind of way, about the Jubilee Greenway, the feature of an upbeat Evening Standard article today. Just after the Tate Modern cyclists follow a different route to the end of this section as the path alongside the river is closed to cyclists. Turn left onto Hopton Street after the Tate Modern and then right onto Southwark Street. Turn right onto Blackfriars Road , heading North towards Blackfriars Bridge, but turn left into Upper Ground just before you cross the bridge. Pass the National Theatre on the right and head under Waterloo Bridge continuing along Belvedere Road. With the London Eye directly to the right, turn left onto Chicheley Street. At the end, turn right onto York Road. To reach the official end point of this section, follow the road around and turn right towards Westminster Bridge where this section ends. 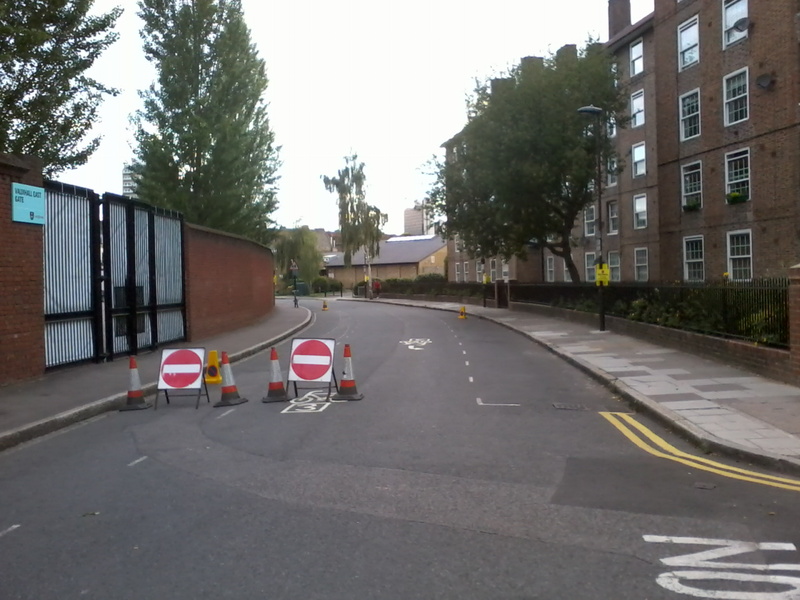 Alternatively, to continue onto section 9, continue ahead onto Lambeth Palace Road towards Lambeth Bridge. 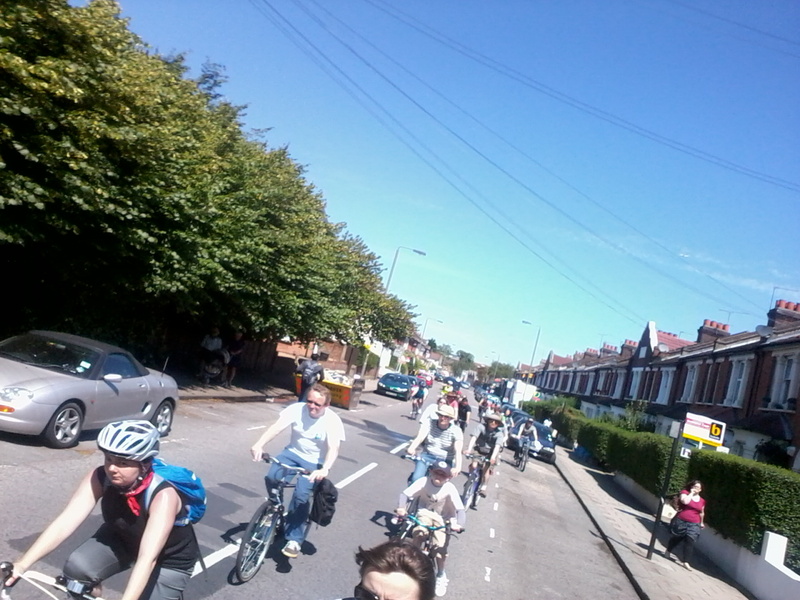 This is my photo of the York Road part today. What a delightful Greenway. 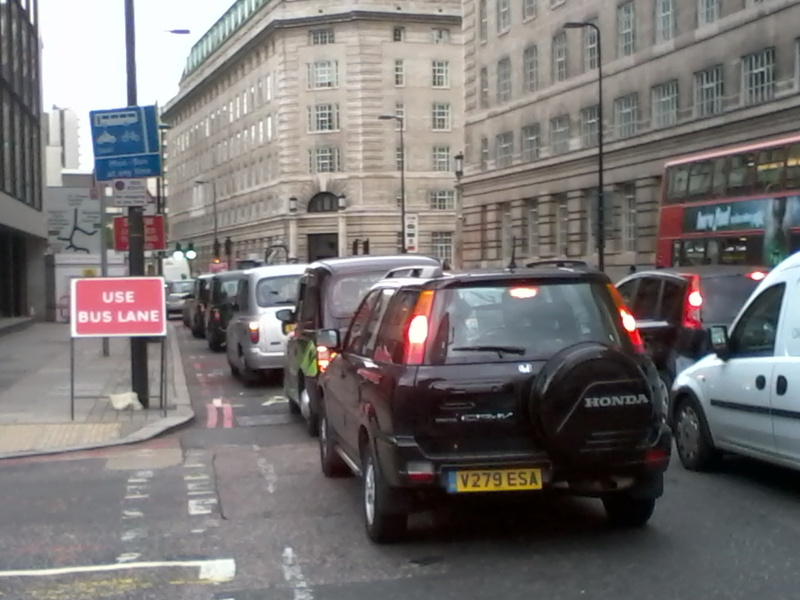 There is no occasion when a large London-wide road user charging scheme should be introduced. Any introduction of a road user charging system should be limited to small, local schemes which have the support of local people. A hands-up survey at the recent Lambeth Community Forum concerning the Vauxhall, Nine Elms, Battersea Opportunity Area showed massive support for making Vauxhall a more pleasant place for people to live. Local residents want the volume of motor traffic to be reduced and the Vauxhall Gyratory and its sprawl of motorway-style lanes tamed. Instead they want Vauxhall to be a place where it is enjoyable to stroll and ride, with outdoor cafes in fresh air and streets returned to two-way working. 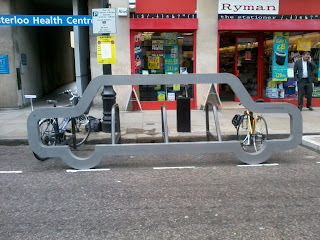 Transport for London consider this achievable by cutting a third of the existing traffic. So, a wonderful opportunity exists for the Conservative Mayor of London to have a local vote on a small, local scheme: to charge motorists choosing to use the Vauxhall Gyratory a sum sufficient to deter a third of them, with the income contributing to the replacement of the gyratory with a more liveable streetscape. It'll meet the 'localism' agenda of the government, endorsed by the Conservative Assembly Members within London, while meeting the desire to remove the gyratory expressed by Lambeth Council, local Assembly Members and the locals. Win-Win! Who arranges the vote? Archbishop's Park, by Lambeth Palace, is one of the four hubs for this year's 'Bike the Borough' event put on by Lambeth Council. The main aspect, as you'd expect from the title, is a great route to ride to see much of the borough, including parts and parks that you may never have been to before. There are led rides from each of the hubs on the hour from 10am. Battle it out against your friend on a pair of vintage rollers connected to a huge dial over a simulated 500m distance at speeds in excess of 50mph! I have added a link in my cycling blogs list to the shiny new Lambeth Cyclists blog/website - well worth a look, in particular for details of this week's Bike Week events. Sunday 18th: Incredible Edible Lambeth ride, starting at 1pm at Myatts Fields Park, will include visits to some great food growing projects in Kennington. and, the big event: Sunday 26 June all day Bike the Borough (http://www.biketheborough.co.uk/), which features a load of activity in Archbishop's Park that I'll blog about separately. A way forward for the future? b) potential for two-way working not shown in TfL's options. Ironically, by removing the gyratory to make Vauxhall more pleasant for pedestrians and cyclists, traffic volume (which must include trips made on foot or by bike) is likely to increase rathet than decrease! 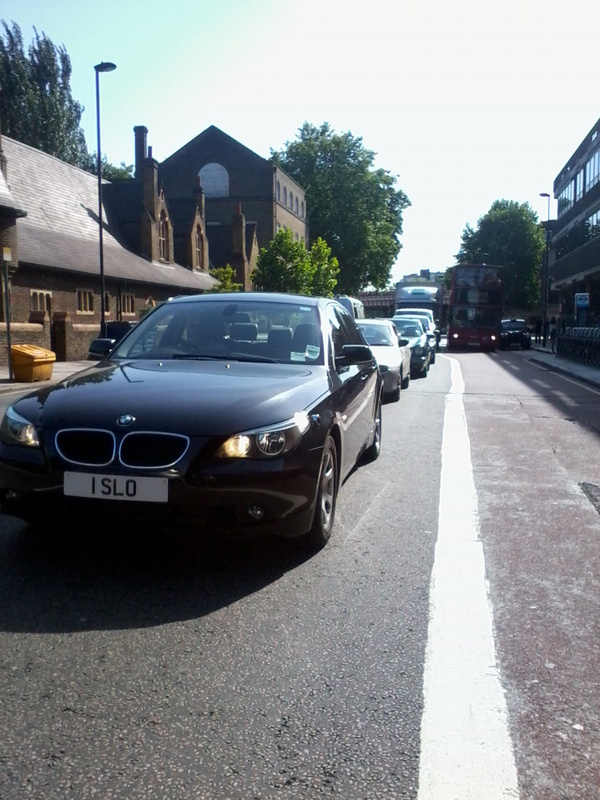 Impossible shout the TfL traffic engineers. But the reality of making a place nicer to wander and cycle around is that more people will make journeys there - just look at the southbank before the London Eye and after. 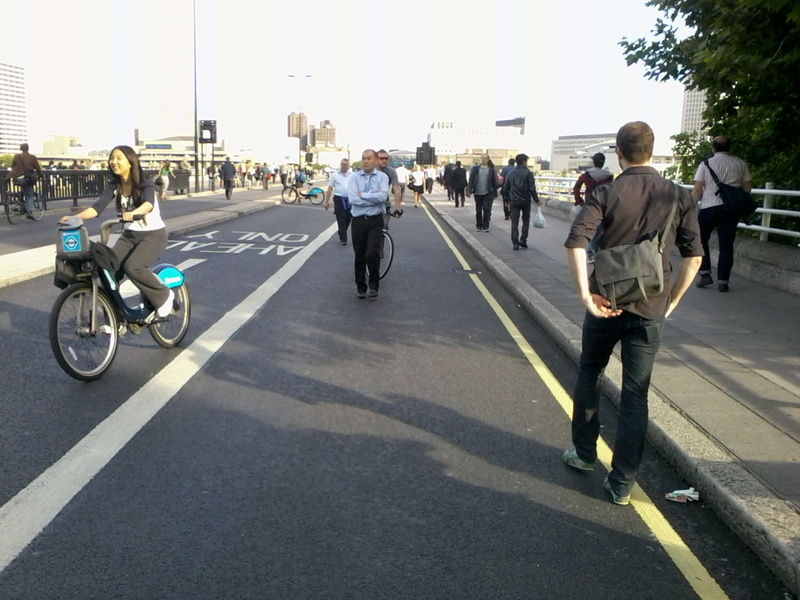 Of course, the engineers may prefer loads of polluting motor traffic over people ambling kind of traffic. Do we really want a motorway style no-mans land to remain in central London, between vibrant Waterloo and the buzzy new US Embassy and Battersea Power Station area? 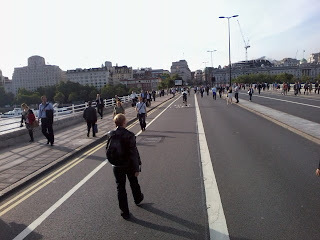 Waterloo Bridge was a pleasure to cycle across today - quiet, unpolluted, spacious. For a moment I thought that TfL were making amends for their disgraceful behaviour on Blackfriars Bridge, but it transpired that no credit was due to TfL - a fire in Aldwych was the cause. Cllr Morgan has sent around a presentation made by TfL at the end of March. Please find attached a link to the TfL presentation made on Gyratory on 30 March 2011. TfL's presentation reflects the Mayor's obsession with smoothing traffic flow rather than achieving modal shift towards more sustainable transport modes. Apparently removing the gyratory isn't a goer as it would require a 36% reduction in motor traffic in the morning forcing motorists to reconsider their mode of transport. Unimaginable, doncha see. It's not desirable to reduce mindless motor vehicle use; we need to maintain the diesel particulate spewing, one person in a car, noisy central London experience. Don't we understand yet that we need to have loads of road space to be able to have the lorries delivering bottled water to sell in Waterloo Station rather than having Network Rail install taps. This, and having loads of taxis because people who daren't cycle because of the taxis feel compelled to use them, is the priority. There's not a chance of making Vauxhall and the rest of central London somewhere nice to walk and cycle around. Will the VNEB area be the new Amsterdam - has anyone seen any detailed plans for making this flat, central London area a cycling nirvana? E&C - public square or (loadsa) traffic flow? 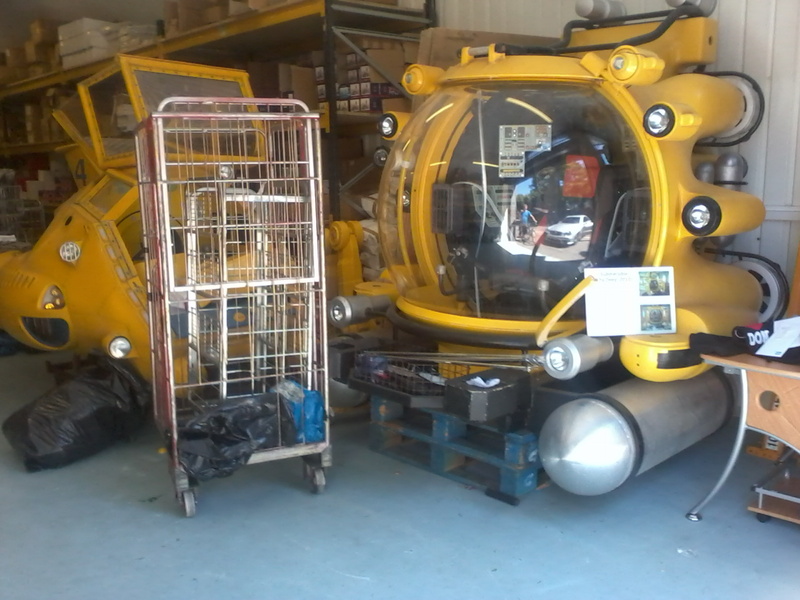 Read more on the SE1 website. Meanwhile the BBC reports that DEFRA have said that London's air pollution targets that should be met by 2015 may not be met until 2025!!! Pop down to Lower Marsh on your bike and you can make use of Lambeth's new car shaped cycle parking: 1 car = 10 bikes. You may have seen these at an event before but Lambeth are the first to install it on street for regular use rather than for an event. It will be in Lower Marsh for one month rather than permanently because of the forthcoming regeneration scheme. Richard Ambler, Lambeth's Cycling Officer, says, "Lower Marsh is a good test bed because it has high cycle parking stress and very limited footway space. It is also a good way of testing demand before installing something more permanent. 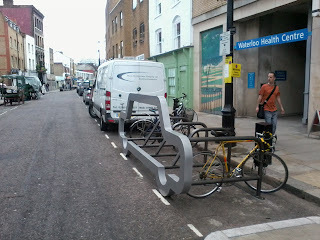 However, I’d like to see if we can install a perment one of these somewhere else in the borough." The Mall was more awash with black cars than normal as I passed through today. 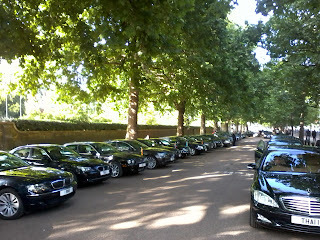 In addition to the usual belching black cabs we had shiny black cars by the dozen. The numberplates on these executive limousines gave the game away - IND 1, THAI 1, 1 ARG, 1 KW, 1 VEN, 1 YEM, 1 SWE, SVK 1 A, BAM 1, MAK 1, BOS 1 A, GYA 1, 1 EST, 1 CI, 1 SLO, I CZE, TUN 1, ZAM 1, NEP 1 and on and on and on. Having been driven a mile or two from embassies the shiny black cars were parked up in the Mall (the photo shows a few parked in the cycle lane) before being driven a mile or two back to the Ambassadors' residences. Just for a laugh, here's a Google Map showing The Mall plus 'Embassy' which shows that most of the embassies are within easy cycling or walking distance of the Mall, or a short bus ride. In total, 4.3 million trips per average day have been identified as potentially cyclable, equivalent to 23 per cent of trips by all modes and 35 per cent of trips by mechanised modes. The Mayor has set an ambitious target to increase levels of cycling in London by 400 per cent by 2026. To achieve this it would be necessary for one in every six potentially cyclable trips to be cycled each day, throughout the year, based on the trip volumes of today. The report's intro states, "In „Cycling Revolution London‟, the Mayor sets out his vision for London to become a cyclised city: one where people can ride their bikes safely, enjoyably and easily in an environment that embraces cycling. Making this a reality requires that physical and cultural changes are made in the city, demanding further investment, strong partnership working across the Capital and continued political leadership." Sorry, Boris, I don't think the Ambassadorial elite are interested in showing that kind of political leadership and working in partnership with you to achieve cultural change. They'd rather show off their congesting, polluting toys. I am grateful to the June issue of 'The Marketer' magazine for flagging up the long-running PedFlag programme in Kirkland, Washington, US. "The basic concept of the PedFlag is to assist the pedestrian in gaining the attention of the approaching motorist. With the aid of the brightly colored flag that can be held out in front of the pedestrian and/or waved, the pedestrian is better able to attract the attention of the driver sooner by becoming more visible. This is a device that is low in cost and can be installed for pedestrian use in a timely manner. Once the equipment is installed at the crossing, the only ongoing cost is the replacement of the flags. Depending on the location and season, it can be zero to five flags a week. " The Marketer (magazine of the Chartered Institute of Marketing, no less) featured this as a case study on social marketing for behavioural change and I think you'll agree it's as fine an example of failing to deal with the underlying issue of a motorcentric society as you can possibly find - something the magazine signally failed to note as it twittered on about 'Promotion Problems' in getting more flag use ('The vast majority indicated they felt safe and were sure that drivers could see them') and 'Place Problems' (Others noted that often there were no flags on their side of the street').